Sure, it’s cool that X-Men: Days of Future Past revealed teasers for their giant Sentinels at this year’s Comic-Con, but it’s not like they had anybody actually dressed up like a Sentinel for the reveal. No, if you want to a film’s characters show up in real life, as portrayed by the actors who played them, then look no (frank)further than Cloudy With a Chance of Meatballs 2! (Food puns!) Just Jared caught most of the film’s cast in full costume, decked out to look like their animated counterparts. One might have thought the film would give fans psilocybin and let them loose into a cafeteria, where all the talking food would no doubt serve as advertisement. But it is a children’s movie, so maybe this way is smarter. 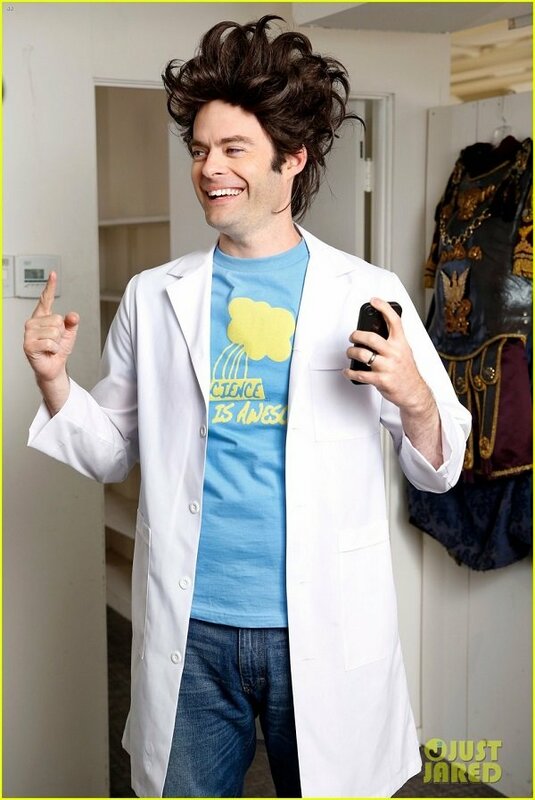 As you can see above, Bill Hader is dressed to impress and invent insanity as lead character Flint Lockwood, wearing his signature coif and “Science is Awesome” t-shirt. I need this t-shirt in my life. Not the one that Hader is actually wearing though. This isn’t a stalker thing. Below is a picture of Anna Faris as news reporter Sam Sparks, dressed in her very un-reportery shorts-and-boots combo. Given this character doesn’t have much going on as far as visual flair is concerned, the giant glasses are the natural place for caricature, but it just looks eerie. Uh oh! Andy Samberg has far more visual appeal as the first film’s quasi-villain Baby Brent. 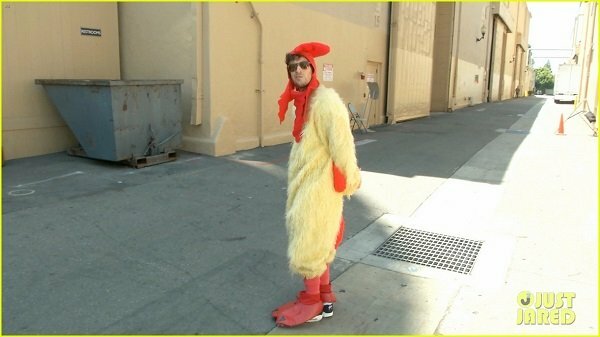 It looks like he’s on the good guy’s side this go around, although standing around all day in a giant chicken suit in the sun has got to provoke at least a little bit of evildoing. But let’s not get shitake twisted. (Food pun!) 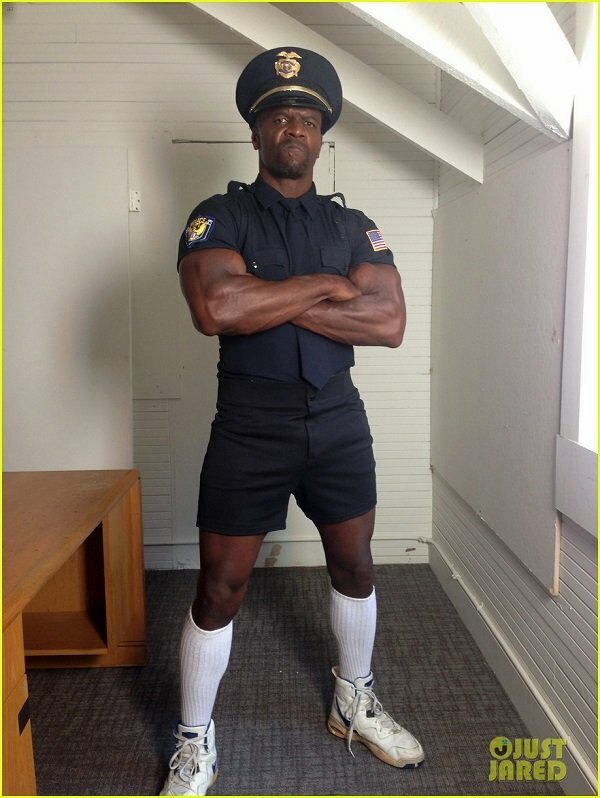 The greatest of all the images is the mean mug of Terry Crews set atop a musclebound body wearing shorts and sneakers, complete with knee socks. Mr. T. opted not to reprise his role as the gruff policeman Earl Devereaux, and Crews is the perfect replacement in my book. I wonder if he actually walked around or had to just stand there in fear of a complete wardrobe malfunction. Granted, this photo was posted on Just Jared last week, but that doesn’t make it any less amazing. The Sony Pictures sequel Cloudy 2 centers on Flint returning to the food-clogged town of Swallow Falls, where he finds his machine has now moved onto creating food/animal mutant hybrids. You can catch the film in theaters on September 27, 2013. Check out the colorfully corny trailer below.